Talk about a big-name merger. Boston Red Sox third baseman Kevin Youkilis is engaged to marry one of the sisters of New England Patriots quarterback Tom Brady, according to a Red Sox team source. Youkilis first met Julie Brady (who is one of three Brady sisters) at a Patriots party after the team was knocked out of the 2010 playoffs – according to the Boston Herald, which first reported the story. She is a schoolteacher with a 5-year-old daughter and has never been married, according to the newspaper. In 2008, Youkilis had a marriage ceremony with Enza Sambataro, who had dated Ben Affleck, but the pair reportedly never filed the necessary paperwork to make the union legal. They split up two years later. Sources tell the Herald that Youkilis was at Lucas Oil Stadium in Indianapolis to watch the Patriots in Super Bowl XLVI. Well, it’s not exactly on the level of the high-profile-celebrity pairing of Tom Brady and Gisele Bundchen, but there’s news of another Boston-related pairing with high-profile connections. According to the Boston Herald’s Inside Track – Red Sox first baseman Kevin Youkilis and Patriots quarterback Tom Brady are about to become brothers-in-law. Youkilis is reportedly engaged to Julie Brady – one of the quarterback’s three sisters. The website says that Julie Brady is a teacher in California and will move to Florida to be with Youkilis. They spent time together in Indianapolis to watch the Super Bowl, which Tom Brady’s Patriots lost to the New York Giants. It will be Julie Brady’s first marriage. According to ESPN – Youkilis took part in a marriage ceremony with Enza Sambataro in 2008, but the two never were legally married before separating. Sambataro reportedly dated Hollywood Red Sox fan Ben Affleck. 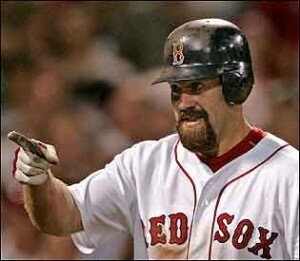 Youkilis has been known as a gritty, hard-working player and an excellent fielder in his eight-year career with the Red Sox. The three-time All-Star batted .258 with 17 home runs and 80 RBIs in 2011. It appears that two of Boston’s favorite sporting sons will soon be related by marriage. Boston Red Sox infielder/DH Kevin Youkilis is engaged to marry Julie Brady – the sister of some guy named Tom who happens to play quarterback for the New England Patriots. The Greek God of Walks first met Tom Terrific’s sister at a postgame party at Patriot Place in 2011, just after the New York Jets booted the Patriots out of the 2010 playoffs. Youk was reportedly in the Brady suite at Lucas Oil Stadium for Super Bowl XLVI to watch Tom’s Pats lose to that other New York team. According to the Boston Herald – the couple dated for a year before deciding to tie the knot. The soon-to-be Mrs. Youk (or, in Boston parlance, ‘YOOOOOOOOUK!!! !’) is a schoolteacher, with a five-year-old daughter. Plans appear to be for the ceremony to happen in the offseason in California, where the Bradys are from. It will be her first marriage and his second – though his first officially. Youkilis was married – sort of – to Ben Affleck’s ex, Enza Sambataro, though the couple apparently never filed the required paperwork. We assume things will be better organized this time. From a Boston fan perspective, both players could use a re-boot in terms of perception. Youk hit just .258 in 120 games for a disappointing Red Sox team, and there are some in Beantown who are unhappy enough with Brady’s inability to win the Super Bowl without competent receivers to call for the Brian Hoyer era. No, really. Here’s what we don’t know about the future Mrs. Youk – if Red Sox fans bash his performance in her presence, will she pull a Gisele and fire right back in the direction of his teammates? We can but wait and see. This entry was posted on Saturday, February 11th, 2012 at 5:07 am	and is filed under Sports. You can follow any responses to this entry through the RSS 2.0 feed. Both comments and pings are currently closed.